New Boundary Technologies creates enterprise software solutions to provide complete control of remote equipment. Their TankVista service www.newboundary.com/products/tankvista gathers tank level readings from Massa ultrasonic sensors and presents them in an interactive web dashboard. E-mail and phone alerts are sent based on user-defined thresholds. TankVista lets customers monitor and manage their industrial, oil and gas, and agricultural storage bins and tanks from anywhere, 24/7. Visit www.newboundary.com for more information. The Tank WATCH-IT System is a turnkey remote monitoring solution. 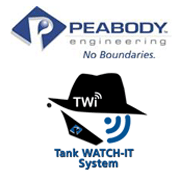 Peabody Engineering utilizes the best from industry leaders to offer a packaged solution and one offers Massa’s Kynar housed non-contact ultrasonic sensors, Digi Gateways for anywhere connectivity over LAN/WiFi/Cellular, and New Boundary web interface and user defined alerts. Visit www.tankwatchit.com or our YouTube Video to learn more. Sensors2Cloud is a specialized internet of things solution-as-a-service provider. They help businesses improve processes, save money and enhance customer service by using the power of internet of things.The company offers a flexible template-based platform for customers to provision sensors, customize applications and manage users. Their Tank Management Applications periodically collect data from your tanks using MassaSonic® SonAire® M3 Ultrasonic Sensors to provide you with the data analytics you need for inventory management, reconciliation, and just-in-time deliveries. Please visit: www.sensors2cloud.com for more information. NFI Corp is the global leader in manufacturing custom, high-performing printed graphics. The wide array of solutions includes long-lasting barcode labels, serial number labels, domed labels, asset tags, tamper proof labels, metal nameplates, and electrical membrane switches. Backed by 40 years of success – and fueled by a commitment to innovation – NFI Corp is certified in ISO-9001, MIL specs, UL®/CSA/CE/RU, Lean Manufacturing, and Green Workplace. From design to delivery, NFI Corp’s certified experts guide customers through every step of the process. Finished products meet strict quality standards and can endure any environmental condition including salt water immersion and extreme temperatures. Visit www.NFIcorp.com to learn more.